This is actually a 120 acre State Park in which the name Waianapanapa means "glistening water". It's off the Road to Hana at Mile Marker #32 with outstanding panoramic views. If you're driving to Hana, this is an absolute must stop on your way. The black pebbles of Pa'iloa Beach (inside the park) with the contrasting beautiful blue-green waters, describes the water perfectly. The beach itself is fairly small with a cave on the east side that goes through to the ocean. You'll probably recognize it as having seen its photographs on postcards or information on Maui or Hawaii beaches. It's quite a sight to behold with the deep blue waters and white caps of the waves crashing against the jagged cliffs. The spray and mist are amazing to watch! Visitors tend to come and go fairly quickly, so the beach is never very crowded. 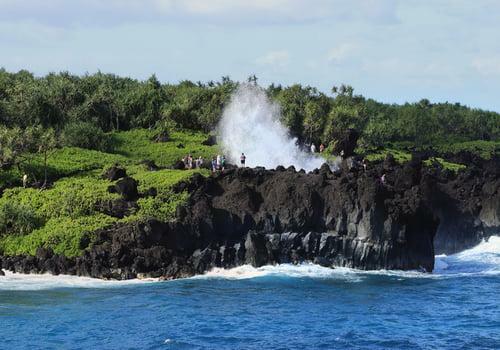 If you like to hike, there are trails in the park, a blowhole, sea arches, caves, fresh-water pools, islets, heiau (religious temple), and pre-contact archeological remnants. You'll probably also see a seabird colony and anchialine pools. This isn't really a good beach for anything but walking and viewing the scenery. Swimming can be treacherous if the surf is strong. Just east of the beach you'll see islets towering in the bay. Cliff jumping can be risky, but if the conditions are just right, the danger isn't as high. If the water is clear and you can see where you're jumping, you'll probably see someone jumping off one of the cliffs. The amenities are very good and parking is excellent. There are cabins, drive-up camping, and tent camping, camping gear rentals, guided camping excursions, picnic tables, barbeque grills, restrooms, showers, and water fountains. However, there is no lifeguard.